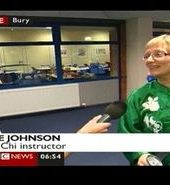 Principal Instructor of the British Chen Style Tai Chi College, Sue Johnson started her journey into Tai Chi in 1989 when she attended a 10 week course on Yang Style Tai Chi at her local library. 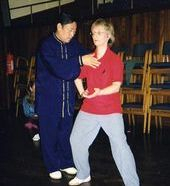 In 1990 she then began to study Chen Style Tai Chi and Wild Goose Qigong. 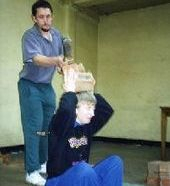 In 1994 she was one of the first female students of "Iron Shirt" Qigong in the UK to succeed in having bricks broken on her head and a paving stone smashed on her chest! Sue has also studied some Shaolin kung fu. 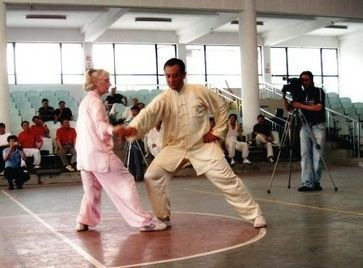 She was fortunate to meet Grandmaster Ip Chun whilst learning Wing Chun and in 1998 she trained with Professor Li Deyin when she was learning the 24 step Yang Form. 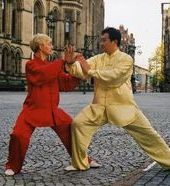 Since 1999 Sue has made regular trips to China to also train with Master Liu Yong, an Indoor student of Chen Zhenglei. 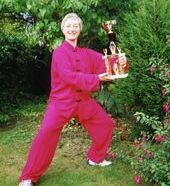 Having taught both Tai Chi and Wild Goose Qigong since 1992 Sue opened the British Chen Style Tai Chi College in 2000. 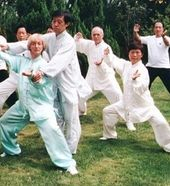 Sue has also taught in Tai Chi in Adult education, Further education, students with learning difficulties ,Day care centres, care homes (chair based) and university students. 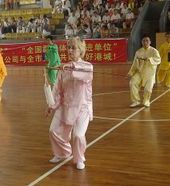 In 2015 she was invited to teach Tai Chi in Sri Lanka. 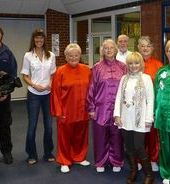 Sue Johnson has been featured in several TV documentaries on Tai Chi on Chinese television. She holds a City and Guilds teaching qualification. She is also a Reiki healer. 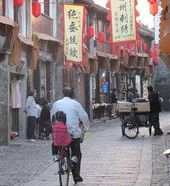 She speaks some Mandarin and has organised several training trips to China for her students. 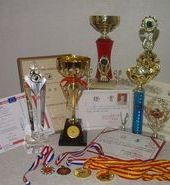 Some of her students have won medals in both the UK and China. 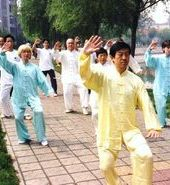 Some are now established teachers of their own Tai Chi classes. 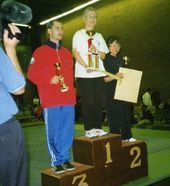 From 2001 until 2009 Sue made regular trips to China to train with Master Liu Yong. 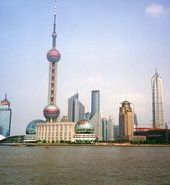 Master Liu Yong, an Indooor Student of Chen Zheng Lei, has many students in Shanghai, Tongzhou, Nantong, Nanjing, Lianyungang and Ganyu. Along with some of her students, Sue visited these cities to train with local students and also for ongoing training with Master Liu Yong. 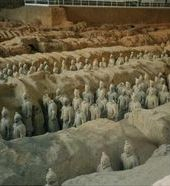 They also learned about calligraphy, Chinese Brush Painting, music and Beijing opera. 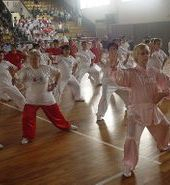 In Nantong and in Lianyungang they were also featured in TV documentaries on the progression of Tai Chi. Sue also appeared in a TV programme for Central China TV about the 24 Step Yang Form. 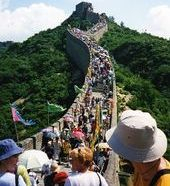 "We saw many wonderful sights and visited many other places of interest." 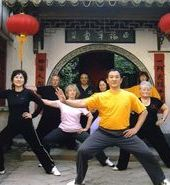 Published in 2002, Grandmaster Chen Zhenglei's book "Wonderful Taiji Kung Fu"
This book contains a section on recommended Tai Chi instructors. Sue Johnson was the only British Instructor to appear in this book. 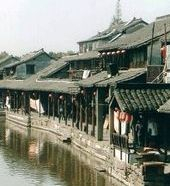 Sue began to study Wild Goose Qigong in 1990. From 2007 - 2013 she studied Wild Goose Qigong with Dr Bingkun Hu, a Qigong Master who lives in California. 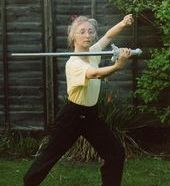 Dr Hu made an annual trip to the UK to provide workshops on various aspects of Wild Goose Qigong. 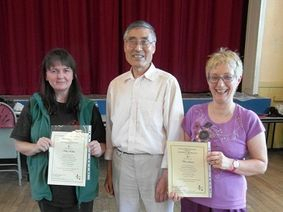 In 2012 Sue received a certificate for completing 200 hours of intensive training with him. This covered 1st 64, 2nd 64, Kunlun Bagua Qigong, Tripod and Spiral Qigong, Soft Palms Qigong, Patting Meridians Qigong, Five Element Bagua Qigong, Kidney Strengthening Qigong. 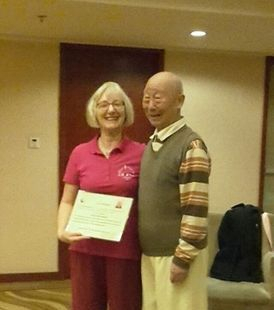 In 2016 Sue Johnson achieved a lifetime dream and went to Wuhan China, to study Wild Goose Qigong with the current lineage Grandmaster, Chen Chuangang. 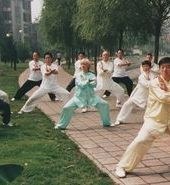 This was her 12th training visit to China, but all previous trips had been to study Tai Chi. This was an amazing trip, working intensely with the Grandmaster for 7 full days. 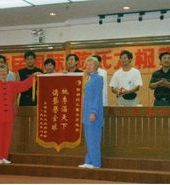 At the end he awarded her with an Instructors certificate personally authorising Sue to teach the Authentic, Accurate and Honest version of the Wild Goose Qigong 1st and 2nd 64, that were handed down to him alone by his Mother, Grandmaster Yang Meijun. 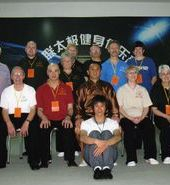 In October 2017 Sue returned to Wuhan with 9 of her British students to complete an 8 day intensive training course with Grandmaster Chen. Sue is now bringing this knowledge to UK students in both weekly classes and workshops.